Limited Editions: one of 77 for each design, check out options below. Art Prints are individually printed, energized, hand singed and numbered by Ottawa artist Elena Khomoutova. Artist provides the signed Certificate of Authenticity, embossed with her special Seal. The Limited Edition Art Prints are museum quality collectable prints. Description: Artist uses ancient Feng Shui energy principles in her art and her own life. Festive Ottawa - fine art print was created with intention to bring the Good Luck. Seven similar objects are in her romantic landscapes. The number 7 represents a good luck. Seven people are wearing hockey jerseys, including Ottawa Senators and Original Six: Chicago Blackhawks, New York Rangers, Montreal Canadians, Toronto Maple Leafs, Detroit Red Wings, Boston Bruins. A beautiful winter sunset is on the background. Christmas holiday lights are on the trees. Ottawa Rideau Canal, Winter, Winterlude Festival, Parliament, National Art Center, Peace Tower, Chateau Laurie, skaters are on the print. The main colors of the painting are: red, blue, yellow, green, orange, violet, pink, brown. 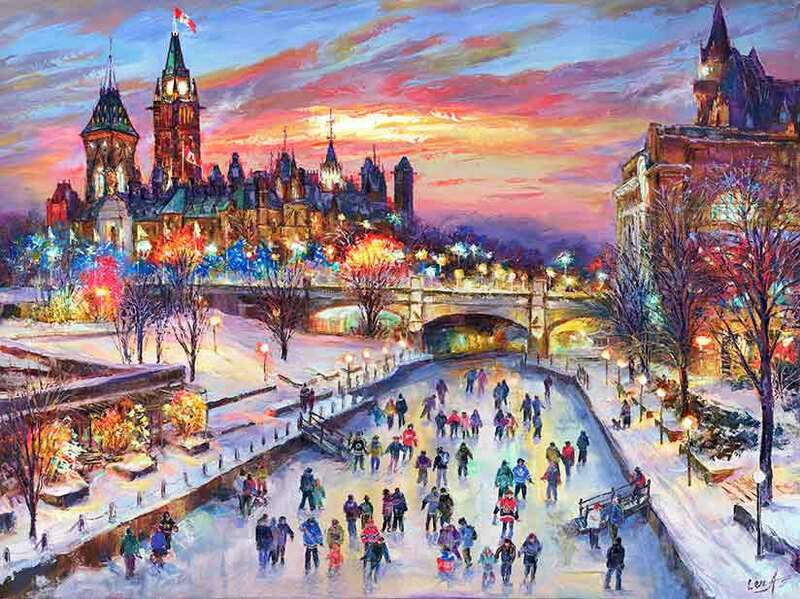 The print was created based on "Festive Ottawa" painting. Watch a short video below about the painting. The painting was sold and only limited quantity of prints are available. We are committed to quality products and your satisfaction is 100% guaranteed! Imagine how you will feel if you are lucky to have it on your wall or give as a gift. The print is the awesome gift for Housewarmings, Weddings, Engagements, Valentine's Day, Birthdays, Holiday, Christmas, Hanukkah, New Year, Graduation, Mother's Day, Father's day, Thanksgiving, any romantic occasion or a magnificent and exciting treat for yourself. Take advantage of today's awesome Promotion, check out HERE for details! Bring Good Luck in your life with the magic art via "Add to Cart" button below!